The City of Keller, recently ranked as one of the 10 best Dallas suburbs to call home, is situated in the northeast corner of Tarrant County, 15 miles from downtown Forth Worth and just 25 miles from downtown Dallas. Keller was ranked by Money magazine as the 7th best city in the nation to live in, and has been one of the most popular places to purchase a home in Texas over the last decade. Between 2000 and 2010, Keller watched its population surge by 45%—climbing from 27,345 to 39,627, according to the U.S. Census Bureau. 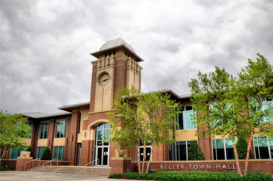 In 2010, Keller received a Certificate of Achievement for Economic Excellence from the Texas Economic Development Council. The Keller ISD—which celebrated 100 years of educational excellence in 2011—was recently awarded Tarrant County’s lone FAST 5-Star rating. FAST, (Financial Allocation Study of Texas) identifies both academic excellence as well as fiscal responsibility. Keller ISD has 39 schools total, all of which maintained reading and mathematics scores that ranked well above the state’s averages. An overwhelming majority of Keller’s residents earn their incomes working in the information technology field in computers and mathematics. Since the IT field is one that is ripe for future growth, the economic outlook for Keller is a promising one—in 2009, the average median income in Keller was $113,760, over 135% higher than the state’s average of $48,259. Public transportation is not well developed, as the majority of Keller’s residents are commuters. But there are numerous airports—from Meacham Field to Alliance Airport and DFW International—that are all within a short drive from the city. Dining out presents limitless possibilities as over 3,000 restaurants are located within 20 minutes of Keller, and plenty can be found inside the city limits. For those seeking an ideal location to raise a family, Keller is a solid fit. Keller’s growth trends and job outlook provide a great choice for those seeking an excellent investment opportunity.